After four long months Davaris Daniels finally received clarity on his status at Notre Dame after being investigated for academic fraud. 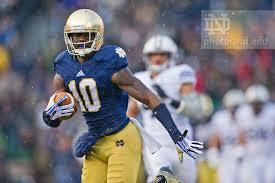 Davaris Daniels will not play for Notre Dame this season and it seems that he he will not play for the Irish again. Philip Daniels, the father of Davaris, took to twitter and said, “Finally after over 4 months my son got an answer! He is done at Notre Dame and will weigh his options for the future!”. This should really come as no surprise, especially after reports started surfacing that none of the five players in the academic fraud investigation would be returning to the Irish this season. Keivarae Russell announced last week that he would not be able to play this season but plans to return next season. While Davaris Daniels was surely a talented player, he had very been inconsistent during his entire career at Notre Dame. While he showed flashes of brilliance, he was not able to maintain it for a full season. Losing a player with the talent of Daniels is never good but Notre Dame is doing just fine in the receiving corps this season with Will Fuller, Corey Robinson, Amir Carlise, Chris Brown, and CJ Prosise all being productive in the passing attack.